The master point is when you have a big object to take, the servo of "open and close"always goes back to the same position (value). Because the grip uses springs, the user doesn't have to manage the servo's position with the size of the object to take. Take and move objects from your robot's environment. 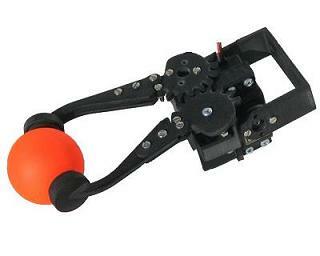 The grip is very easy to program because of the POB-Eye servomotors native functions. Develop your own softwares dedicated to your needs. This grip has been design for the POB-BOT, but can be used on your own robot.